This is a dual release of Pariah Child in Ireland and Metal on Metal records. 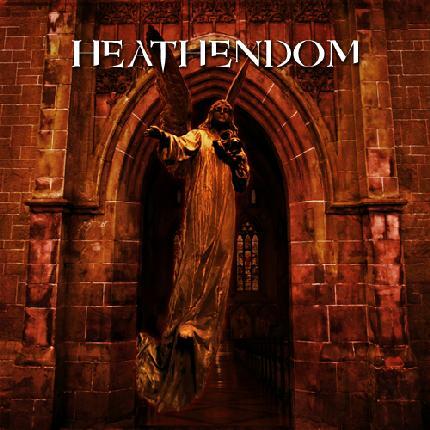 Heathendom released a rare EP back in 2005 called Nescience and this LP is that EP plus all new material from the band on side B. This Greek band plays classic 80s metal. The records starts with Angelus, a short dark choir piece that leads into A Poem be Rote. The track reminds me a lot of Metallica circa 1985 but the lyrical content is something totally different and the vocalist goes through many different styles a bit like King Diamond. War and Pain continues in a similar style but with more layered vocals. The main riff of this song reminds me of Slayer, just played a bit slower. Metal Pabulum slows things down at first but then the track really picks up speed and features a strange organ piece under which a fast Slayer like guitar is played. This is a pretty cool instrumental piece that goes from slow to fast and back again. Silent Mangling finishes the original EP and the album side. Side 2 is one two chapter track called Haunted in Hell that is split into five parts total. It starts like a horror film soundtrack, with lush keyboards and acoustic guitars. The piece slowly grows darker as do the lyrics. A pretty cool LP if you dig old school 80s style heavy metal.